Happy Independence Day! Today I have another holiday guest post by Jonathan Sprout who, inspired by American Heroes, has created a whole collection of award-winning music in an effort to remember those who have made a significant impact on the history and development of our country. As you can tell from the image and the quote above, today we are remembering Thomas Jefferson. Thanks to Jonathan’s post, I have been in more thought about what our country was like back in 1776 when we first declared our independence. Rereading the words in the quote above, and thinking about it’s significance in relation to the recent law set by the Supreme Court is eerily on point and gives me goosebumps. As we celebrate today, whether it’s through parades, waving flags, and chili cook-offs (ahem), we always end with a grand ole celebration of the beautiful lights in the sky. As you get ready to whoop it up today, I would recommend incorporating some time to listen to Jonathan’s words about Thomas Jefferson, finding some good kid reads on this American Hero’s impact in our history, and learning together about the Declaration of Independence. In his post below, and in “What He Wrote,” Jonathan gets the conversation going enough to pique kids’ interests to learn more about freedoms, and civil rights. Getting into a discussion about what he/she might have done if they were in Jefferson’s shoes will likely invoke some interesting responses. What do your kids feel are their basic rights and how would they act if someone was impeding upon them? It’s always interesting for me to hear what Em has to say. Even if the response is “I don’t know,” I’ve found that I am more motivated to think along with her. You can find more information and links on this topic at Jonathan’s site. Thomas Jefferson: My, What He Wrote! Many people become heroes because of what they do. Once in a while, someone becomes a hero by what they say or write. To me, it’s Thomas Jefferson’s words that define him as one of the great heroes of his age. Thomas Jefferson did many amazing things as an inventor, architect, master gardener, President. He lived his life on the cutting edge of progress. He sent Lewis and Clark on their great mission and more than doubled the size of the United States. He also did some not-so-amazing things. But, my, what he wrote! There he was, in his early thirties, representing the colony of Virginia in Philadelphia in early summer, 1776. He and representatives from 13 colonies had come together to form a new government. Mr. Jefferson was asked to put into writing for the King of England and the rest of the world what the representatives were demanding and why. I can’t imagine how overwhelming that first blank page must have appeared to Jefferson. Where would you start? For several weeks, he wrote, edited, revised, tweaked, trashed, and re-wrote until he came up with most of what Americans now call the most important document in America – the Declaration of Independence. Have you ever actually read this document? It’s hard for me to imagine how one guy could have done this, mostly on his own. His Declaration was approved by Congress in July of 1776. The rest, as they say, is history. Jefferson, with his words, expressed the highest of human aspirations becoming the leading spokesman in the revolution of ideas that transformed the way people actually thought in America, and to some extent, around the world. He changed the world with what he wrote. Find lyrics at Jonathan’s official Thomas Jefferson page. Jonathan’s song about Thomas Jefferson, “What He Wrote,” is from his Grammy nominated album, American Heroes #3. World UFO Day 2015 – Celebrate with Dino O’ Dell and Zar the Alien! Today is World UFO Day and what better way to celebrate than with a bunch of friends and an alien named Zar. Dino O’ Dell, a Kansas City-based musician, educator and storyteller has a deep and abiding interest in anything to do with space, UFOs, and life on other planets. He is also the author of the book Zar and the Broken Spaceship, which tells the story of a hip, three-eyed alien named Zar who finds himself on Earth after his spaceship crashed down and went kaput. This book is colorful and interactive. The sequence of actions that lead to the success of Zar’s journey back home are wildly fun and reminiscent of popular reads such as Press Here and Lovable Furry Old Grover’s Resting Places (a classic), all of which encourage literacy, eye-hand coordination and body awareness. Plus, talking like an alien is just naturally entertaining. O’ Dell even goes ahead and includes an alien-speak glossary at the end. Fizzle Moo! Kids at home can play along with the book (guided along with colorful illustrations by Uruguayan artist SantiagoGermano), and afterwards they can treat themselves to this fine video in which Zar moves from speaking his native tongue to groovin’ and rhymin’ in English. 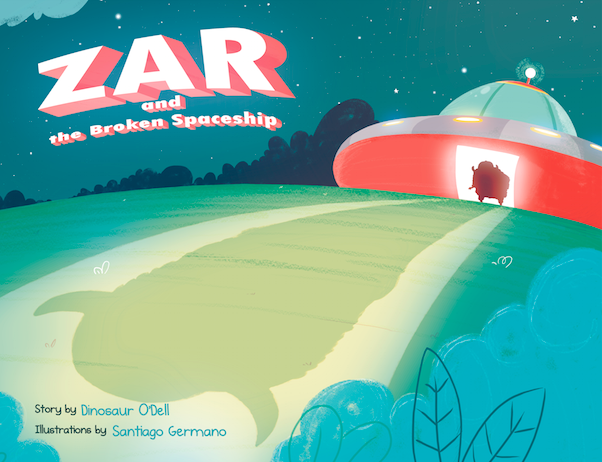 Zar and the Broken Spaceship is the first in a planned series of “Zar” books and is available today through Dino O’ Dell’s site, Book Baby, Reading Reptile. The single is available for purchase and download through iTunes and CD Baby. “The Cat Came Back” is one of the classics we’ve listened to from Laurie Berkner since Emily was little. I am thrilled to see Laurie’s new video for it, which was made through YouTube Spaces. Ok so there’s a cat in it, and it’s cute. But what I also love about this video is Laurie’s charm. Her vibrant personality lights it all up, right along with the mustaches, and the cat ears. It’s just a feel good experience and it’s exactly why Laurie has been such a staple in our home! Want to play along with Laurie? If you are in the New York City area, the next Laurie Berkner’s The Music in Me Teacher Training will be held August 28-31. Learn Laurie’s classroom philosophy and teaching style, 40+ Laurie Berkner songs, and get tools to begin your The Music in Me classes or supplement your current music classes. Learn more or enroll today!